So, um, this is awkward. 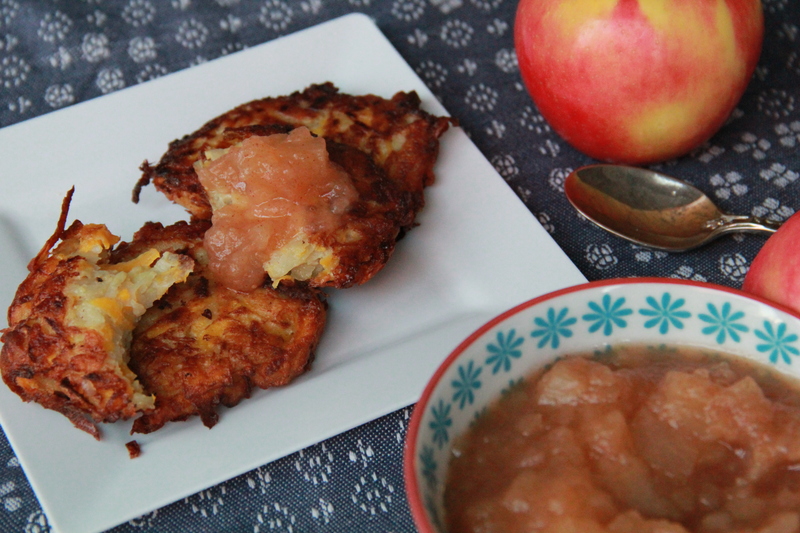 A week after my pro-Christmas/Hannukah-bashing post, and here I am with a recipe for latkes. Jewish guilt at it’s finest. In truth, I love latkes. For me, they’re the best part of Hannukah. Better than the story of Judah Maccabee, better than my aunt Lis’ fancy menorah, better than lighting candles for eight nights running is the golden, crispy latke. 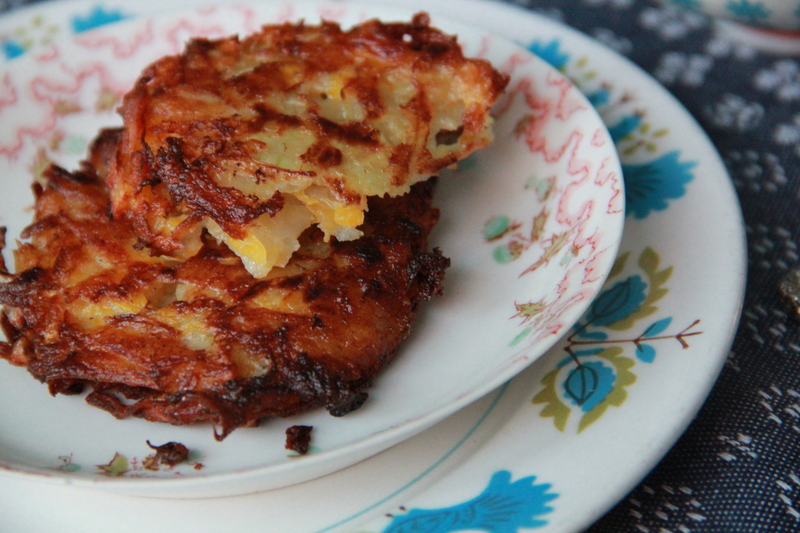 Gently fried and filled with soft potato and, in this case, butternut squash, they’re like hash browns, only Jewier. And with homemade apple sauce? Fine. I’ll admit it. Hannukah is kind of awesome. Using the largest holes on a box grater, grate the squash, onion and potatoes. Do not keep or rinse the grated potatoes in water (doing so will rinse off much of the starch, which is important to help bind the latkes). In a large bowl, mix together the squash, potato, onion, salt, pepper, flour and eggs – mix well, until thoroughly combined. Place the latke mixture in a large colander set over a bowl (it will release a lot of liquid, and you don’t want a soupy mixture). Heat about 1/8-inch canola oil in a medium or large sized frying pan over medium heat. Once the oil is hot, drop large spoonfuls of latke mixture into the pan (you’ll know the oil is the perfect frying temperature if you hear small sizzles when you drop the latkes. The oil should pop and bubble a bit, but if it’s flying all over the place, lower the temperature). Use a spatula to gently flip each latke as it crisps up and browns (this should take about 2 minutes per side), and drain on a paper towel-lined sheet pan before serving. If you can’t eat the latkes straight from the pan, store them in the refrigerator and reheat them on a cookie sheet in a 325 degree oven before serving. In a large saucepan, combine the apples, water, lemon juice, cinnamon, honey and salt. Place over medium heat and bring to a boil. Boil gently, stirring on occasion, until most of the liquid has evaporated and most of the apples have broken down. Remove from heat, cool to room temperature and then chill in the refrigerator. 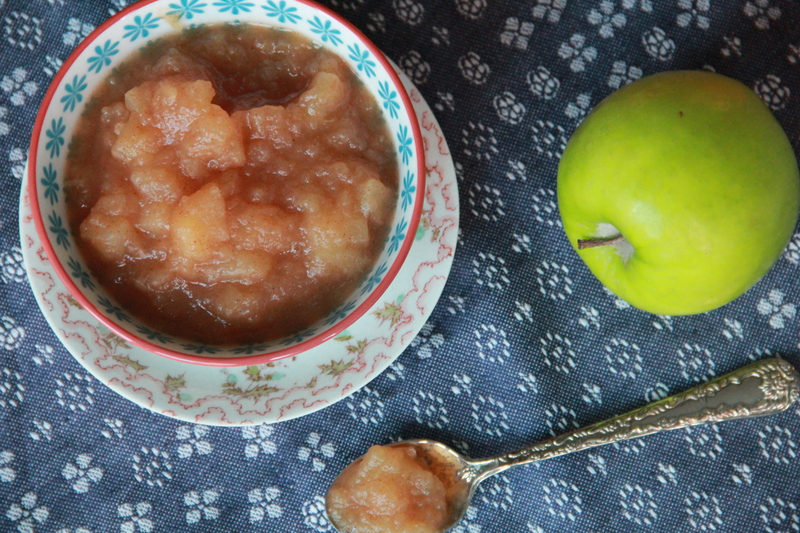 Stored in an airtight container, applesauce will keep for about a week in the fridge. YUM — going to make them asap! Would love to taste your latkes Molls! Did they smell up your apt? I used to make them in an electric frying pan OUTSIDE so they didn’t stink up the house. Mmmmmm…. these are tempting. Might need to break my rule about cooking latkes in the house. Thanks, Molls! oh they ABSOLUTELY smelled up my apartment. But I cracked a window and lit a yummy winter scented candle to help alleviate that special “eau de latke” scent… I won’t make them every night, but for one night only they were definitely worth it! I hope you will point me (again) in the direction of that delicious pecan pie you made….I am having a craving. Hi Liz! The recipe is from America’s Test Kitchen (http://www.americastestkitchen.com/recipes/detail.php?docid=5853) as you’ll see, they make you sign up and pay for the recipe, which I think is pretty bogus. I have the magazine with the recipe in it somewhere — once I find it I’ll pass it along! Thanks Molly…probably best NOT to make it since I will likely polish it off by myself. I love to visit the website and get a dose of “Gilbert ” and I enjoy your writing style in addition to the recipes and the pictures. Hope you have a sweet holiday. Hi there! Just wondering how many latkes this recipe makes? I’m really interested in making these for a 10-person brunch. Would you recommend doubling the recipe? Thanks! Hi! If you’re planning to have these as the main event at brunch, I would double the recipe, yes. (It depends what size you make them, but it should make about 12 latkes.) I hope you enjoy!